Green pools “LEED” the way and the Campus Recreation Center at the University of Colorado, Colorado Springs, is the first public building in Southern Colorado to earn Gold certification status from the U.S. Green Building Council. The center includes innovative features such as solar thermal panels, insulated concrete form walls, and low-maintenance landscaping. 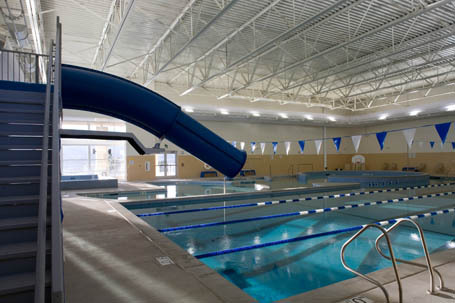 With panoramic views of Pikes Peak, the facility offers a state-of-the-art indoor recreation pool with dimensional features, including the university’s extremely popular waterslide and the quiet swirling water vortex beckoning students to enter into its hydro effects. Four adjacent swim lanes accommodate students wishing to lap swim. After having fun in the pool, a plunge down the waterslide, or a good physical workout, the whirlpool spa offers therapeutic relaxation for tired muscles or a soaking elixir after finals. The center also includes a two court gymnasium circled by an elevated running track, a fitness center, a 12 ft. boulder wall, aerobics and dance room, cafe, multi purpose room, and offices for the Campus Recreation Department.